Paul McElroy wheels away following his penalty kick to break the deadlock in Dungannon Swifts' Irish Cup tie with Glenavon. Pic by Pacemaker. Paul McElroy’s penalty joy added another match to remember for Dungannon Swifts under the management of Kris Lindsay as the latter enjoyed a winning return to former club Glenavon. 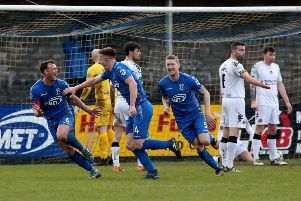 Lindsay, a two-time winner of the trophy as a Lurgan Blues player, helped steer his Swifts side one step closer to another Irish Cup showpiece with a determined 1-0 defeat of Glenavon. Weekend wins helped ease the aches and pains created within both camps by a swift turnaround from Saturday to Monday, with the derby rivals each utilising squad depth for the switch between league commitments and cup ambitions. A slick start by the Swifts featured Mark Patton whipping over a searching cross from the left and Seanan Clucas popped up unmarked at the back post, with his first-time drive forcing Jonny Tuffey into a smart save. 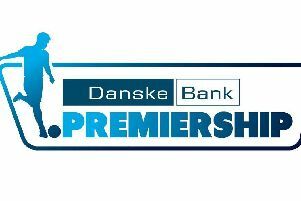 The tie sparked into life around 15 minutes into the sixth-round action as Dungannon survived a scare then launched a swift counter-attack which led to the evening’s first goal. Josh Daniels’ angled ball was fired across off a powerful first-time Andrew Mitchell cross which Andy Hall headed down but Alex Moore diverted with a diving save. Dungannon surged forward with a quickfire reply that resulted in a penalty kick when Seamus Sharkey’s foul on McElroy finished with the latter finding the net from the spot. Glenavon regrouped to regain the upper hand in terms of possession but lacked the decisive edge and decision-making to significantly threaten the visitors’ lead. Dungannon suffered an unexpected setback when New Year loan arrival Michael Carvill limped off around the half-hour mark. Another assured Moore stop prevented any additional pain when the goalkeeper proved alert to get behind Hall’s free-kick attempt from a central position. The Swifts came close to cementing control when a counter-attack allowed McElroy, attacking at pace, to twist and turn inside the area before his low shot drifted just wide. Defensive confusion by Glenavon then led to a loose ball bouncing back into the path of Patton outside the box and his first-time drive from distance flashed wide of the target. With minor moments making the difference, Glenavon came within inches of entering the interval on level terms as Hall’s looping punt into the penalty area appeared to drop into the path of Mitchell but the striker, at a stretch, could not gain a meaningful connection. A Glenavon substitutes’ bench packed with attacking options presented player/manager Gary Hamilton opportunities to inject an increased cutting edge after the break and he turned to Conor McCloskey and Cameron Stewart within the first 11 minutes. Stewart could only flick the ball over the bar at pace and under pressure after Mitchell showed strength and skill to collect and cross off Hall’s pass. Another enforced exit for the Swifts due to injury left commanding captain Chris Hegarty out of action and Glenavon attempts to take advantage included a Daniels header on the run which the winger was unable to control. A rare second-half sight of goal for the Swifts was dragged wide of the mark by Alan Teggart before Moore proved in position to collect McCloskey’s close-range overhead kick. GLENAVON: Tuffey, Marron, Garrett, Daniels, Marshall, Mitchell (Larmour, 67), Hall, Harmon (Stewart, 56), Singleton, Murray (McCloskey, 46), Sharkey. Subs (not used): Hamilton, Norton, Jenkins, Wearen. DUNGANNON SWIFTS: Moore, Hegarty (Ferrin, 62), Wilson, Armstrong, Clucas, McElroy, Teggart, O’Rourke, Patton (Hughes, 69), Smyth, Carvill (Campbell, 31). Subs (not used): Moran, Dykes, McGinty, Lafferty.